Tsukasa Miyazaki, an excellent Japanese violinist, is now bashed by numberless fans of a Japanese girls idol group called AKB48 because of his tweet. Before he appeared in a popular live music program ‘Kayokyoku’ of Tokyo Broadcasting System Television, Mr. Miyazaki tweeted his complaint by saying that he will play the violin for backing AKB48 which he instinctively dislikes. This tweet is already deleted by himself. Here is a screen capture by somebody. This tweet is obviously offensive to this girls group AKB48. My question is why he accepted this offer if he dislikes AKB48 so terribly. If he really dislikes that kind of D-class popular music, all he should do was to discline the offer of live backing of AKB48. The only reason I can find is ‘money’. He accepted the offer and unwillingly played the violin for AKB48 just for money. By the way, who paid the money to him? Of course, Tokyo Broadcasting System. Then who paid the money for making this music program? That is the sponsors. It is said that the average sponsorship for this kind of prime time programs is more than tens of millions of Japanese yen. Why did the sponsors pay so much money for this program? That is because this program has a high viewing rate. Why is its viewing rate so high? That is because AKB48 appeared on this program almost every week. As you know, AKB48 exceeded the previous best sales figures of singles in Japan this year. Since their debut in 2006, the total single sales reached 21.852 million. This is Japanese record. Who made AKB48 one of the best selling contents in Japanese show business? That’s millions of fans. AKB48 fans have ever paid so much money for their singles, albums, concert tickets and merchandise. The expense of fans pushed AKB48 up to one of the best selling popular music groups in Japan. So we can summarize it like this. Mr. Miyazaki was paid for his appearance on this program mostly thanks to AKB48 fans. The most part of his wage for this program comes from AKB48 fans. 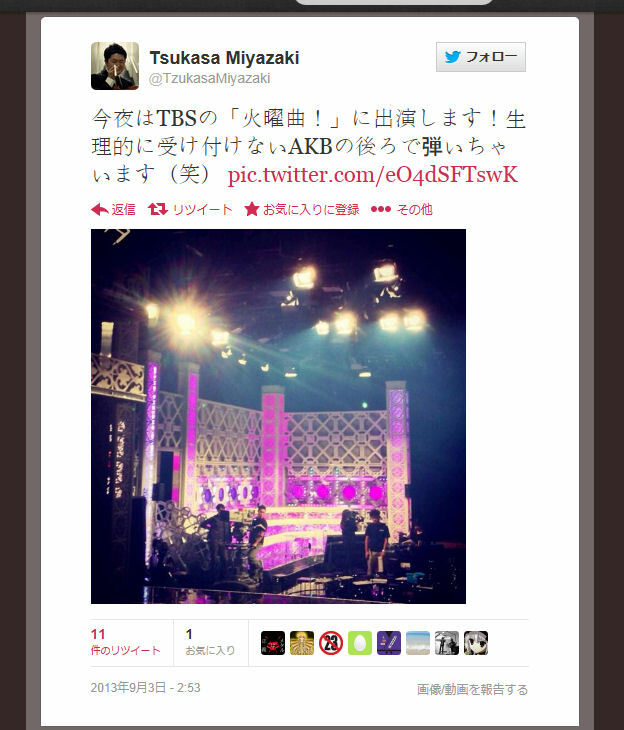 And he bluntly despised AKB48 by tweeting “I instinctively dislike them”. Why did he accept this offer? I would like to ask him this question again and again. I agree that the quality of AKB48’s music is far lower than the classical music like Mr. Miyazaki usually plays. By the way, my favorite pieces of classical music are ‘Verklaerte Nacht’ by Arnold Schoenberg, Mahler’s symphonies, J.S. Bach played by Glenn Gould, etc… However, I also enjoy the D-class popular music like AKB48 at the same time. The most disgusting thing for me is Mr. Miyazaki’s misguided ‘elitism’. Does he mean every idol group like AKB48 has to be eliminated just because its music quality is low? How was he qualified for annihilating the popular music of idol groups like AKB48? I strongly doubt whether Mr. Miyazaki has ever seriously thought about what the music is for, what is the meaning of the music for ordinary people.